Radical anti-Zionist group praises Iranian FM for 'longtime friendship' with Jewish people, expresses 'pain' over Netanyahu's UN address. A delegation from the radical anti-Zionist Neturei Karta organization met with Iran’s foreign minister on Friday, condemning the State of Israel while lauding the Iranian government’s policy vis-à-vis its Jewish minority. 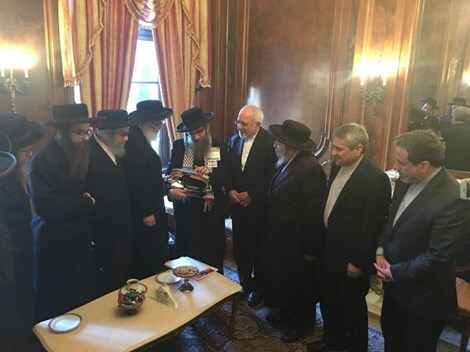 Ten rabbis from Neturei Karta met with Iranian Foreign Minister Javad Zarif in New York City on Friday, the group reported. Led by Rabbi Yisroel Dovid Weiss, the delegation expressed its appreciation for what Neturei Karta called Zarif’s “longtime friendship” with world Jewry. 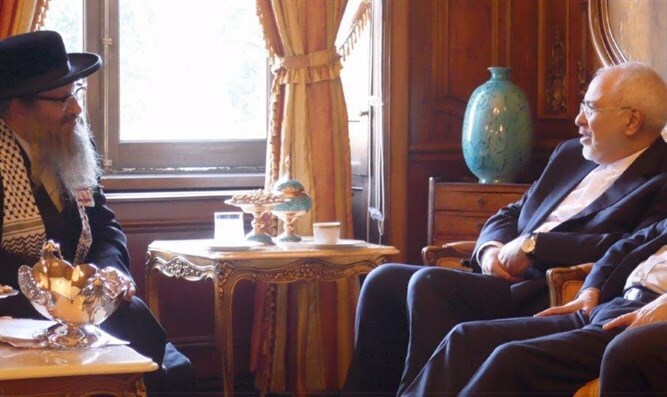 “Rabbi Weiss thanked Dr. Zarif for his longtime friendship with Jewish people of his country and worldwide,” Neturei Karta International wrote in a social media post. Weiss also expressed his gratitude for Tehran’s “protection” of its Jewish minority. While more than 60,000 Jews lived in Iran prior to the Islamic Revolution of 1979 according to the Iranian government, the 2011 census showed the population had dropped to under 9,000. “This is a true example of the teachings of the late Ayatollah Khomeini, who was very clear in differentiating between Judaism and Zionism. Iran does this naturally, not for advertisement,” Weiss said. The delegation also lamented Israeli Prime Minister Binyamin Netanyahu’s address at the United Nations General Assembly last month, during which he accused the Tehran regime of storing nuclear material for its weapons program, in an apparent violation of the 2015 Iran nuclear deal. 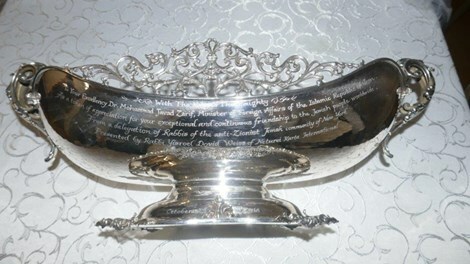 Neturei Karta International presented Zarif with a gift, as a sign of the group’s continuing “friendship” with the Islamic republic. Known for its staunch opposition to the existence of the State of Israel, Neturei Karta has drawn criticism from mainstream haredi figures over its support for the Iranian government. In 2006, Israeli Chief Rabbi Yonah Metzger called for the excommunication of Neturei Karta members, after the group sent a delegation to Tehran for government-sponsored International Conference to Review the Global Vision of the Holocaust. The event drew a number of prominent Holocaust deniers from across the globe, including former Ku Klux Klan leader David Duke.